Have you ever lost money on a remodeling job because you didn’t mark up your costs enough? Have you ever vastly miscalculated the cost of materials, manhours, or special considerations for the age or location of a home? 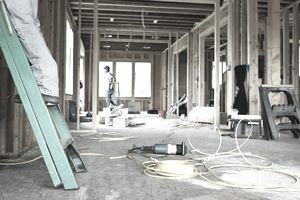 Have you ever been beaten out by other construction companies vying for the same remodeling project? You’re not alone. Losing a bidding war and underselling your construction company are two of the most frustrating problems that face remodeling contractors. Luckily, if you follow this simple method to bid for new projects, you will find that bidding calculus will diffuse into simple math. A walk-through is one of the most important steps a contractor can take to make sure the job is appropriate for his firm. A quick walk-around can help the contractor understand his client’s specific expectations, the starting condition of the home, and can help the contractor gauge whether or not the client will be difficult to work with. Look for potential areas where a subcontractor might be needed (like for HVAC considerations, etc.). Ask for any mock-ups or drawings relating to the project. Don’t be afraid to ask questions—make sure you and your client both understand the job’s expectations before creating a bid. Is your client getting new hardwood floors? Installing new kitchen appliances? Building an additional room? All construction projects require a certain level of supplies, man hours, paperwork, and project management. Fortunately, construction bidding software can help cut down on juggling all these variables, allowing contractors to create a neat, organized list of the job’s credits to your firm. Further down the line, construction bidding software can also help you make quick changes to the job. Did your client decide she wanted different countertops or floors? Changing the estimate is a click away instead of needing to repurpose the entire proposal. Markups do not ensure profits. Homeowners expect contractors to charge 10% for overhead and 10% profit. Don’t fall into this trap—the average remodeling contractor has overhead expenses ranging from 25% to 54% of their revenue. Most remodelers maintain a slim 3% profit margin. There is no reason to lose money on a job—mark up appropriately. While knowing your competition’s prices may limit the amount that you can inflate your final bid, bear in mind that they are suffering through the same markup difficulties as you. Don’t match or undercut your competition when you know that you will probably lose money on the job. After tallying all your costs and ensuring that your company will make a profit, it’s time to present your bid to the homeowner. Make sure that the final proposal is professional. While most construction management software that offers bidding features can create a well laid out final document from the information, you’ve put into the system. There are also a plethora of free online templates that construction managers can choose from. Your potential client is most likely not a construction expert. Talk through the bid with her—make sure she understands all the costs associated with her project. Take the time to answer her questions. And if she catches an error, make sure to fix it immediately. At this point, your part in the bidding process is done, and it’s up to your potential client to decide whether she will move forward with your company.